Femisapien�s new love (oh poor Robosapien)! 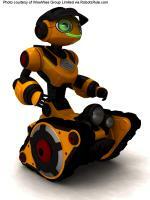 Beatboxing, rhythmically sensitive, dancing robot that also responds to voice commands. WowWee�s first tank tread style robot that plays driving based games, loves to explore, can follow you even in the dark, and more! 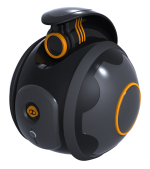 WowWee�s new rolling webcam that can transform back and forth between being a camera with wheels and a rolling ball. The ultimate in fun stealthy spying that can be done at home, or over the Internet. A full fledged micro video project that fits in the palm of your hand! It comes in three models, Swivel, Stick, and Station. Each configuration has its own awesome benefits. 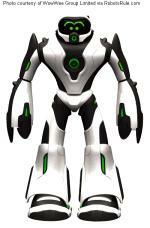 First WowWee robot to use the breakthrough Northstar technology for pinpoint navigation of your home or office. Acts as a WiFi enabled spy robot with full audio and video streaming capabilities, accessible from anywhere in the world you have a Web connection and a Web enabled device like a PC, video game console, or cell phone. A miniature flying light show that looks awesome in the dark. 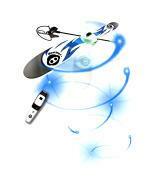 A lightweight flying blade with green and blue LEDs that spin under the control of an infrared remote control.